Based upon a fabulous Rachael Ray recipe found here. This is a somewhat complicated endeavor. It isn’t hard, it’s just a lot of moving pieces going at the same time. I’m going to break this down into two parts, but keep in mind that the potatoes should be going at the same time as the rest of the meal. Rachael Ray did the whole thing in 30 minutes, I watched it. If all your prep work was done and you had a cooperative grill, you could do it quickly too. I have made this recipe many, many times. When we’re dieting, I don’t make the potatoes. I’ve gotten to the point where I usually just eyeball all the amounts. It’s not a fussy dish. If using thin-skinned potatoes there is no need to peel them. Cut into chunks and boil in lightly salted water until tender. Drain. Meanwhile in a small saute pan, heat olive oil and butter together. 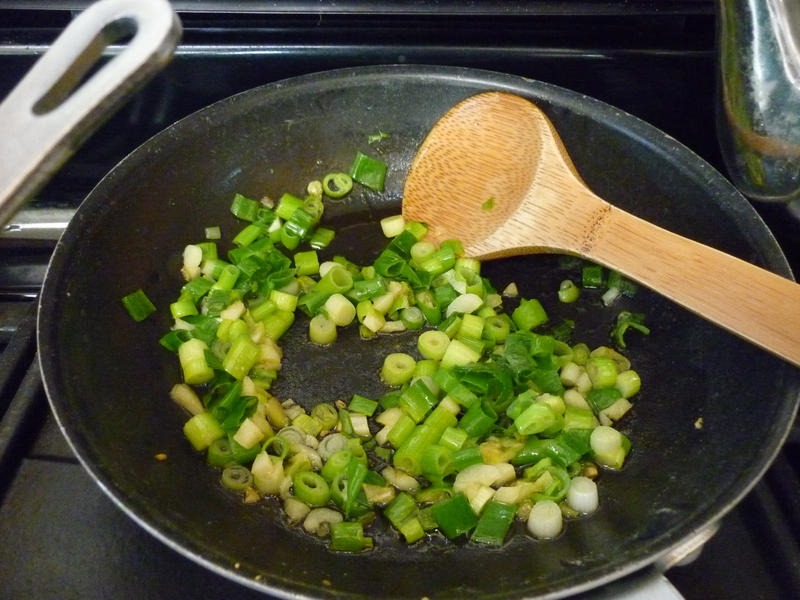 Add garlic and saute a minute or two, then add scallions and remove from heat. Set aside. 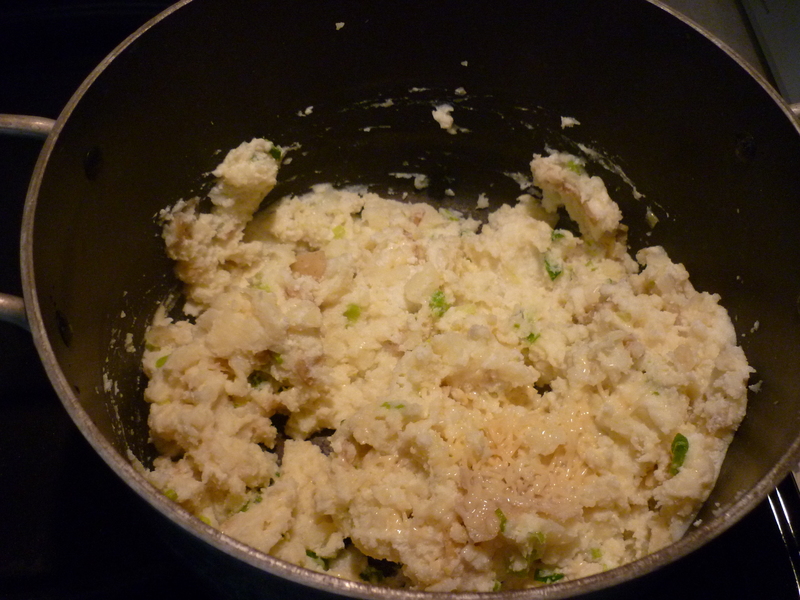 While still hot, smash the potatoes with a masher and add the set-aside mixture as well as all other ingredients. Stir together. Season with salt and pepper. Serve. Prepare a marinade by whisking together balsamic vinegar, Worcestershire sauce, red pepper flakes, rosemary, and olive oil in a large bowl. 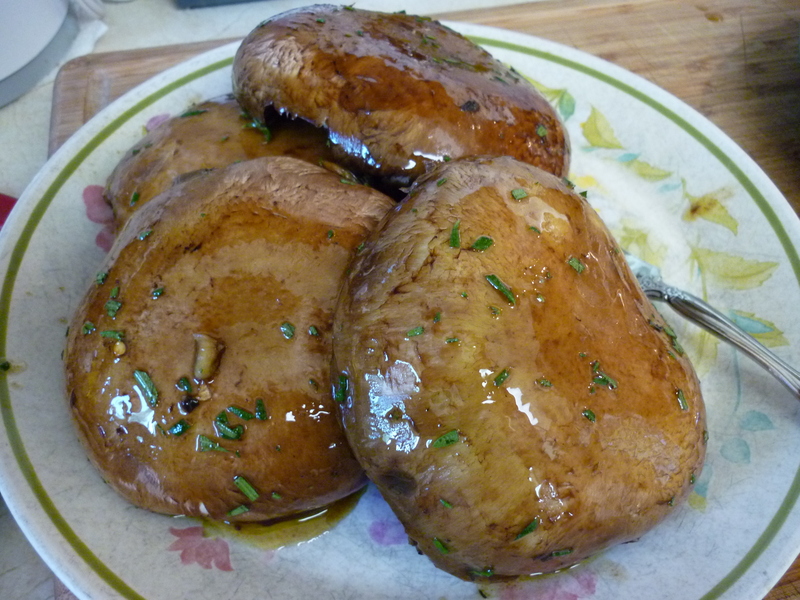 Dip each mushroom cap into the marinade and then set onto plate. 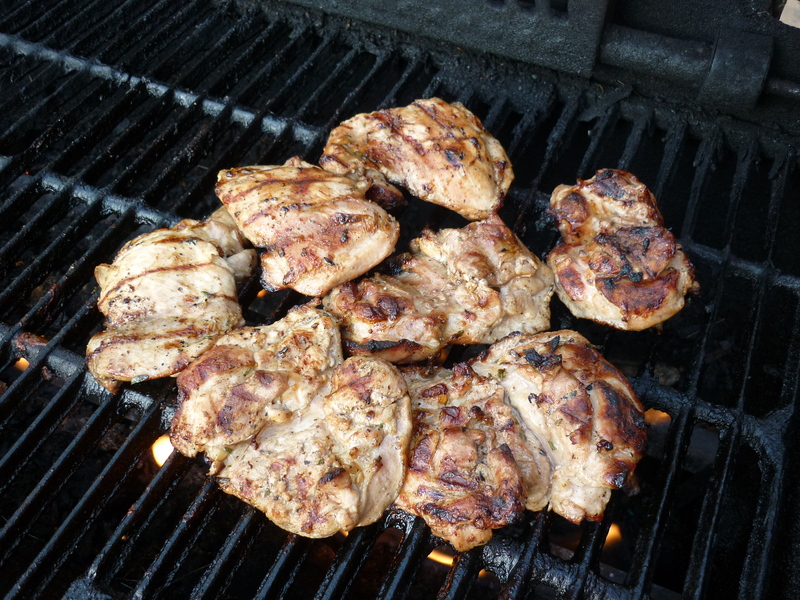 Add chicken thighs to marinade and coat evenly. Set aside while you start the vegetables. 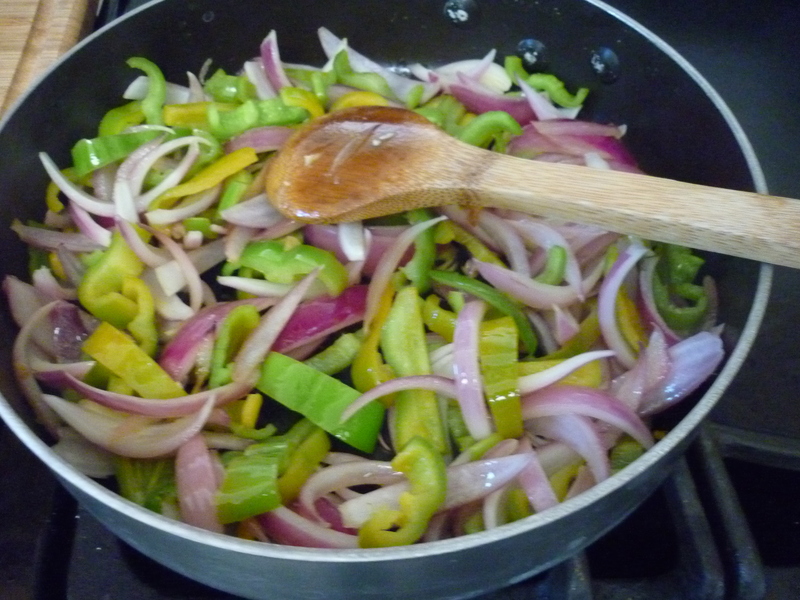 In a bit of olive oil saute together Anaheim peppers, red onion, and garlic until tender. 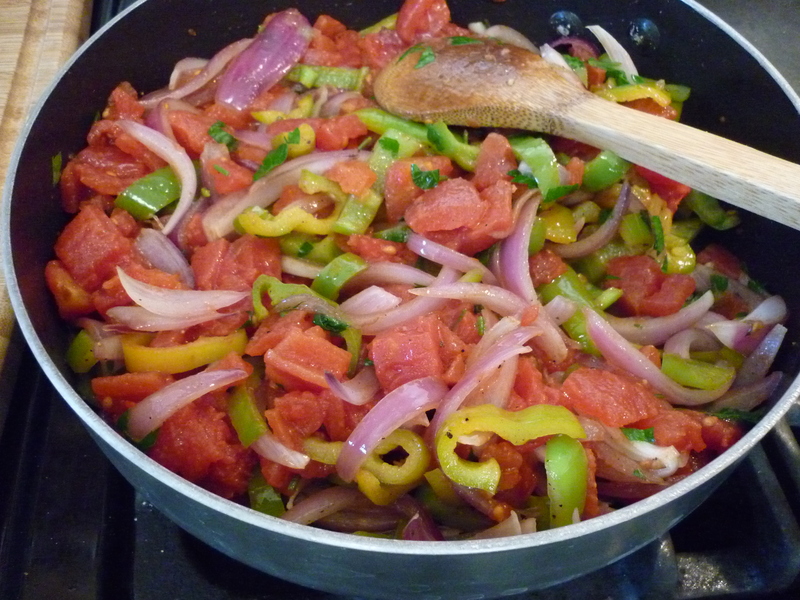 Add tomatoes and parsley and heat through. 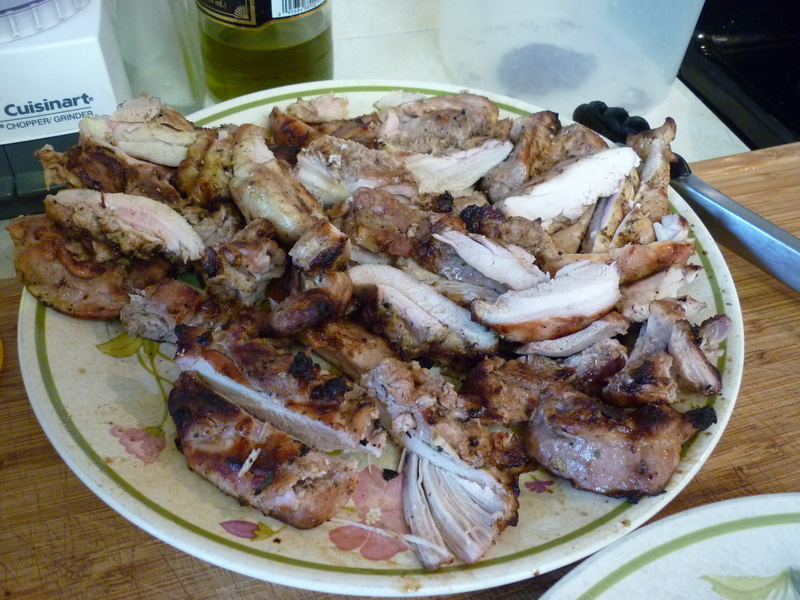 In the meantime, salt each side of the chicken thighs and grill until no pink remains. Transfer to a plate to rest. Rachael Ray recommends putting the mushroom caps on the grill and then placing a frying pan on top of them to gently press down. It works surprisingly well and I have done it that way many times. Grill for 3-4 minutes each side. 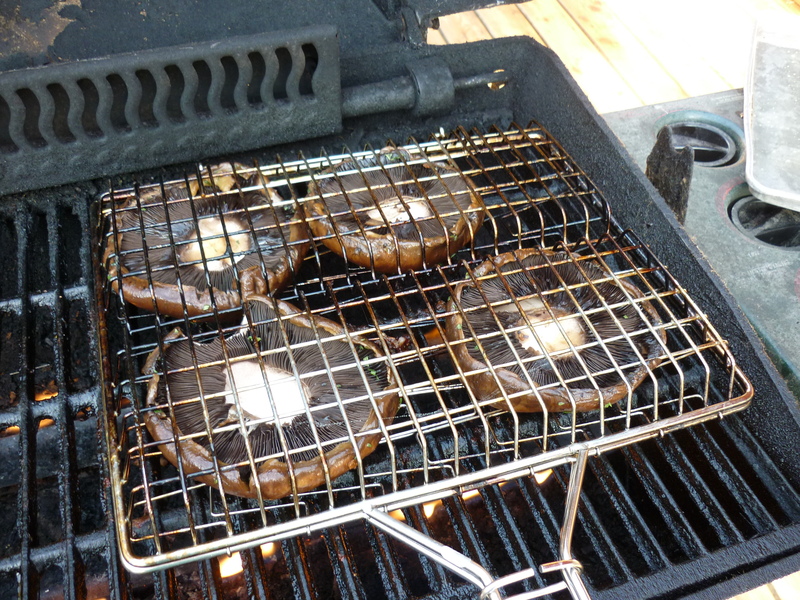 This particular time that I’m showing you, I put the mushroom caps into a grill basket and grilled them that way. It worked great, too. You decide. 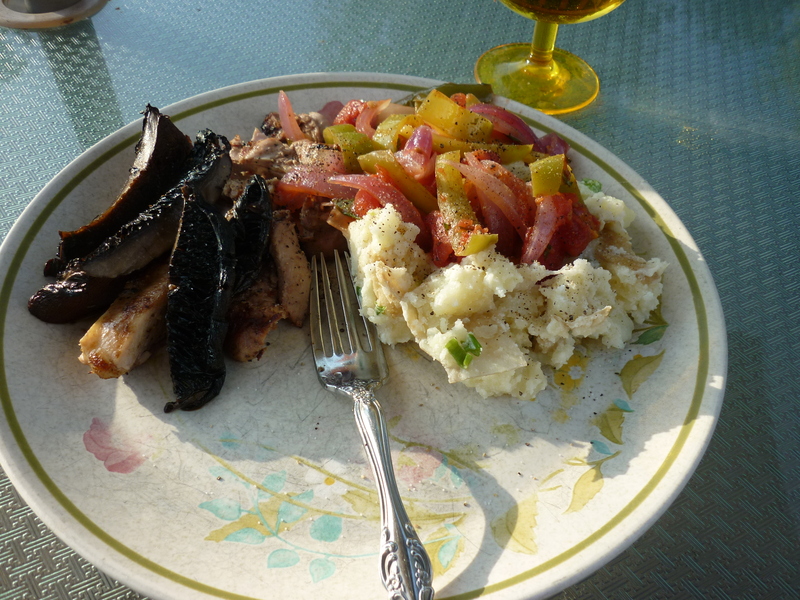 Thinly slice the grilled chicken and mushrooms. 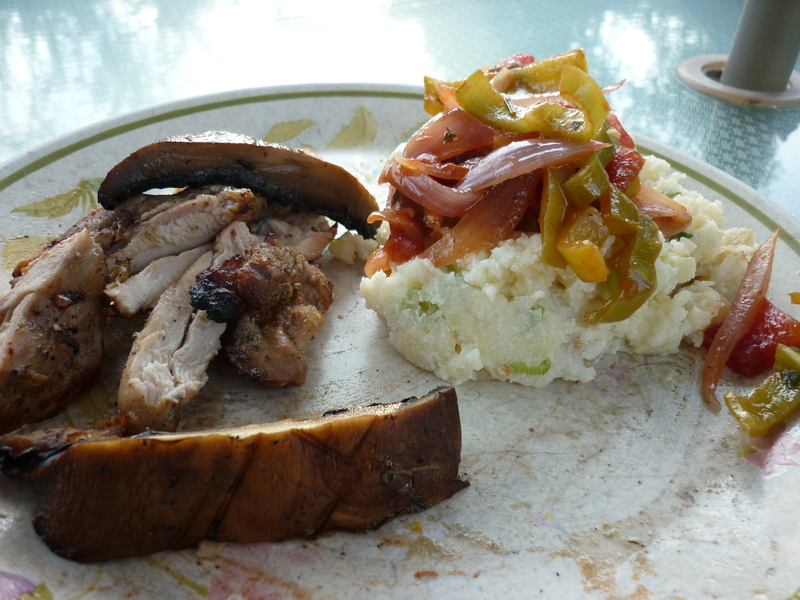 Serve with the pepper onions mixture and the smashed potatoes. Oh, heavenly! 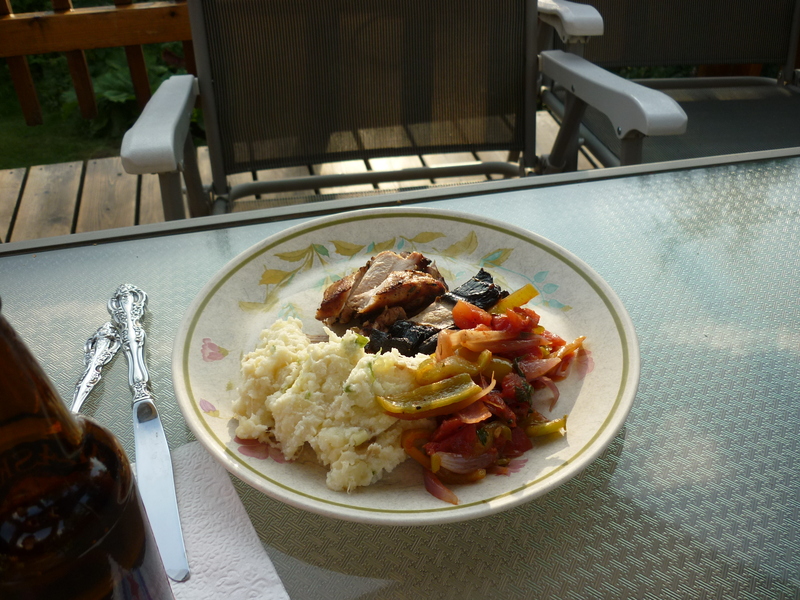 A perfect meal for eating outside on the deck.